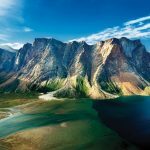 This week’s episode of The Curse of Oak Island is out… in America, at least; we Canucks will have to check out the History Channel this Sunday to catch the newest episode in Canada’s longest-running treasure hunt, entitled All That Glitters. Let’s have a look. Michigan brothers Rick and Marty Lagina, while driving from the town of Western Shore, Nova Scotia, to Oak Island, express their disappointment at the results of their erstwhile excavation of borehole Valley 3, which they hoped had intersected the famous ‘Chappell Vault’. 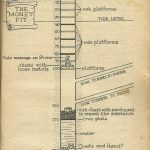 The narrator elaborates on this by explaining that the Chappell Vault is a supposed concrete-covered wooden treasure vault located deep within the Money Pit area which was drilled through by treasure hunters Frederick Blair and William Chappell in 1897. In Season 2, Episode 4 of The Curse of Oak Island, the Lagina brothers and their crew attempted to locate this vault by drilling at a location prescribed by fellow company member and engineer Craig Tester. A core sample taken from this drillhole, which Oak Island Tours Inc. dubbed ‘Valley 3’, revealed the presence of curiously-oriented wood and concrete-like clay at a depth consistent with that of the Chappell Vault. Hopeful that they had indeed located the long-lost Chappell Vault, the Laginas and their crew excavated Valley 3 in Season 4, Episode 6, only to discover that the peculiarly-aligned wood their core sample had brought up was merely a relic of an earlier treasure hunt; the Chappell Vault was nowhere to be found. An interpretation of the Valley 3 core sample and the Chappell Vault, respectively. 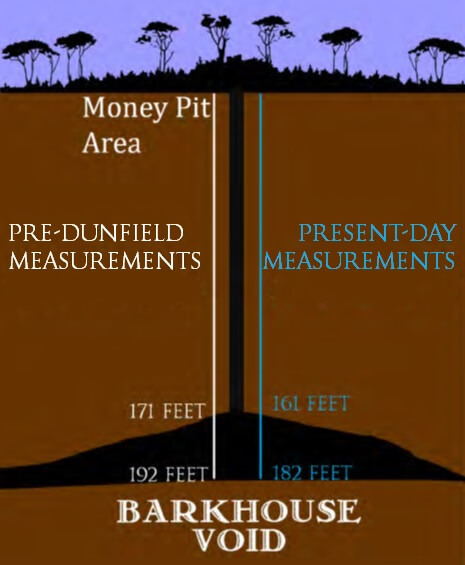 Following the narrator’s explanation, Marty Lagina declares that Oak Island Tours Inc. will now excavate borehole C1, drilled in Season 3, Episode 12 at the behest of Oak Island historian Charles Barkhouse. The narrator then explains how a special camera lowered down the drillhole in Season 3, Episode 13, revealed the presence of something shiny and gold-coloured at the bottom, which Oak Island Tours Inc. hopes is a glimpse of the elusive Oak Island treasure. The Lagina brothers arrive on Oak Island and drive to the Money Pit area, where they meet with fellow treasure hunter Dave Blankenship, Oak Island historian Charles Barkhouse, and two contractors who are currently in the process of excavating Borehole C1 with a hammergrab. The contractors inform the four men that they have been extracting massive boulders from C1, and that they intend to employ a drill rather than a hammergrab upon reaching bedrock at the 150-foot depth. 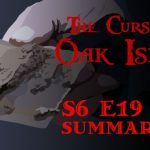 While the contractors continue to make progress at C1, Rick and Marty and their crew turn their attention to the Oak Island swamp, somewhere beneath which many Oak Island researchers believe lies a crucial key to the Oak Island treasure hunt. The narrator explains that the crew plans to drain the swamp by pumping its water overland into the Cave-In Pit, a water-filled depression situated between the Money Pit and the easterly Smith’s Cove, as the pumping of freshwater into the nearby ocean- a far more practical solution- is against environmental law. The narrator goes on to briefly describe how the Cave-In Pit was formed as a result of some sort of subterranean collapse. 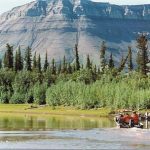 Following that, he recounts how, in Season 4, Episode 3, professional diver Tony Sampson discovered a long wooden plank submerged at a section of the swamp at which metal detectors indicated the presence of a significant quantity of buried metal. In order to prevent the drainage hose from hindering work at the Money Pit area, Oak Island Tours Inc. buries a steel pipe beneath the Money Pit access road and pulls the hose through it. The crew attaches the hose to the pump without incident and starts up the machine, initiating the long-awaited drainage of the Oak Island swamp. Two days later, the swamp is completely drained and dry enough to allow for a heavy-duty excavation. Marty Lagina- who has, in the past, expressed his aversion to the Oak Island swamp- climbs into an excavator and begins to dig at the location at which Tony Sampson discovered the wooden plank. In accordance with environmental law, Marty does his best to separate the organic peat and vegetation from the inorganic rock and clay, dumping each respective material into a hay-bounded stockade. Throughout this process, treasure hunter Jack Begley inspects the dump piles and the pit from which they were extracted with a hand-held metal detector in the hopes of locating the mysterious metal indicated by previous surveys. Initially, he finds nothing of interest. 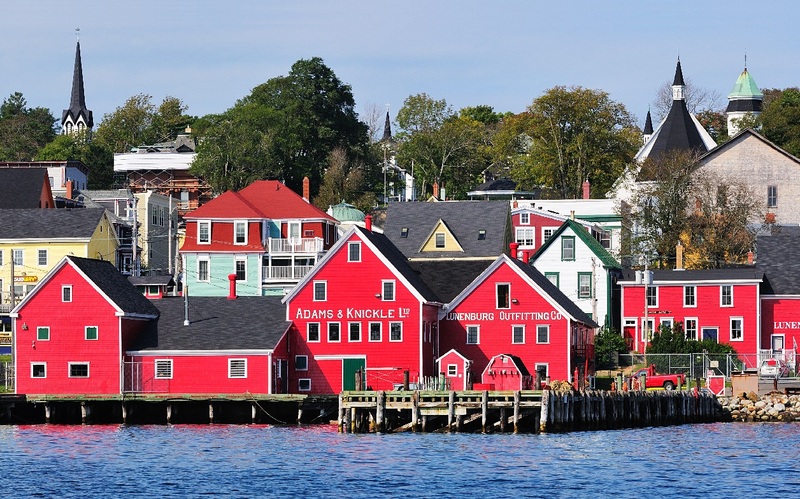 While the rest of the crew labours in the swamp, Oak Island historian Charles Barkhouse travels to nearby Lunenburg, Nova Scotia, along with author and investigative journalist Randall Sullivan. The two men plan to scour the archives of the South Shore Genealogical Society in the hopes of uncovering useful or interesting information regarding Oak Island’s history. At the Genealogical Society headquarters, the Lunenburg Academy, Charles and Randall meet with archivist and photographer Stephen Ernst. Upon being prompted, Ernst shows the two historians a topographical map of Oak Island drawn up by A.F. Church and Company, a Bedford-based surveying firm, in 1883. Immediately, Charles Barkhouse observes that one of the labels designating Oak Island says ‘Kidd’s Treasure’, a reference to the theory that the Money Pit is the site of the lost treasure of 17th Century pirate captain William Kidd. The narrator then launches into a brief account of Captain Kidd’s piratical exploits and his hanging in 1701 at Execution Dock in London, England. Barkhouse and Sullivan notice that the map also includes the names of Oak Island’s landowners at that time. Among the names is a ‘McInnis’, almost certainly related to the Daniel McGinnis who, according to legend, was one of the three men who discovered the Money Pit in 1795. 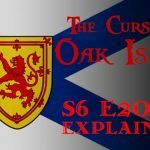 Barkhouse and Sullivan dig around in the archives and quickly unearth an old book which includes the genealogy of the McGinnis/McInnis family of Nova Scotia’s South Shore area. 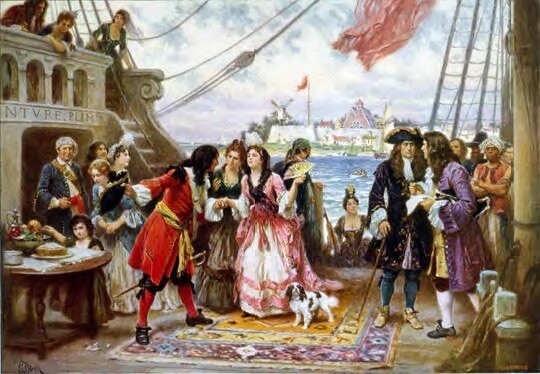 In the book, they come across an old legend which tells of a sailor who, while on his deathbed in the mid 1750’s, confessed to his bedside companions that he had been a member of Captain William Kidd’s crew, and that the pirate captain had, prior to his execution, buried a treasure amounting to ‘two million’ on an island east of Boston. 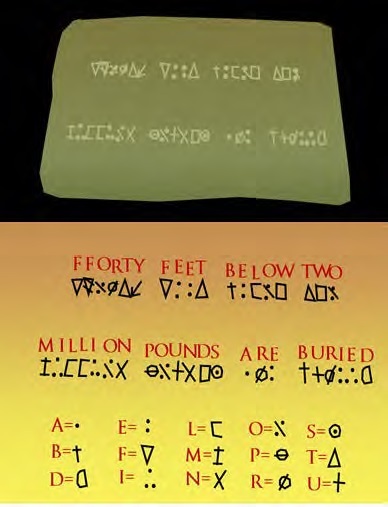 Interestingly, the code known as ‘the Kempton symbols’, believed by some to have been inscribed on the stone slab discovered at the 90-foot depth in the Money Pit in 1804, form a simple substitution cypher which, when decoded, reads “FORTY FEET BELOW TWO MILLION POUNDS ARE BURIED”. Back at the swamp, Marty continues to excavate the location at which Tony Sampson discovered a long wooden plank, and at which earlier metal detecting surveys indicated the presence of metal at depth. Unfortunately, Jack Begley, equipped with a hand-held metal detector, is unable to locate any metal objects in the pit or the dump piles. When the excavator can dig no deeper, the crew decides to refill the hole and postpone the excavation of that particular section of the swamp until another metal detecting survey has been conducted in the area. Later, treasure hunter Dave Blankenship, Jack Begley, and Marty’s son Alex Lagina meet at the Money Pit area with Andrew Folkins of Irving Equipment Ltd. Folkins informs the crew that the steel caisson being driven down drillhole C1 has encountered a very hard substance, probably either a large boulder or bedrock, and that progress is slow but steady. The narrator and Marty Lagina then inform us that the contractors plan to drive the caisson to a depth of 160 feet (and not 150 feet, as initially planned), and will excavate the rest of the drillhole with a 39” drill bit. That night, the Oak Island crew celebrates Drayton’s find in a local bar. 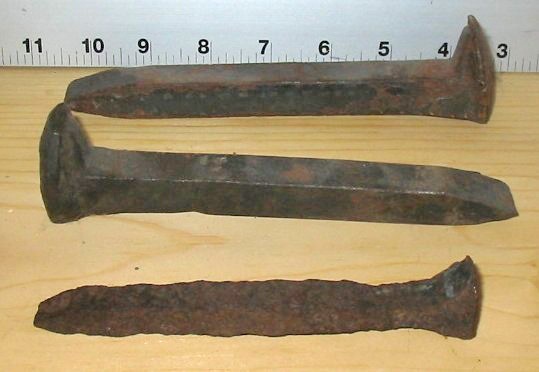 They discuss the difference between railroad spikes, which Drayton’s discovery appears to be to the ignorant observer, and old ship nails, which Drayton maintains the artifact actually is. They agree to have the artifact analyzed by a professional who will be able to definitively determine its nature. The treasure hunters also express their excitement regarding the excavation of drillhole C1, which is expected to be completed shortly. Later, Rick Lagina, Charles Barkhouse, and Andrew Folkins of Irving Equipment Ltd. stand by the Money Pit area in anticipation as the last few inches of C1 are drilled through. 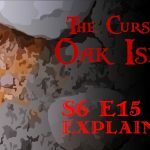 Rick and Charles, who are soon joined by their fellow treasure hunter Craig Tester, remark to Andrew Folkins that, if he and his crew manage to extract something significant from the cavern below, they will go down in history. Folkins leaves to join his crewmembers, and returns in short order to announce that the cavern at the bottom of C1 has been breached. 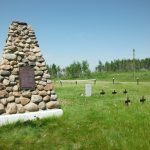 In 1875, Sophia Sellers, daughter of Oak Island’s contemporary landowner Anthony Graves, was tilling the land east of the Money Pit when her plough and ox team fell into a 10-foot sinkhole. This cavity, which was about 6 or 7 feet in diameter, was located directly over the hypothetical path of the Smith’s Cove flood tunnel, believed by many to feed seawater from Smith’s Cove into the Money Pit. 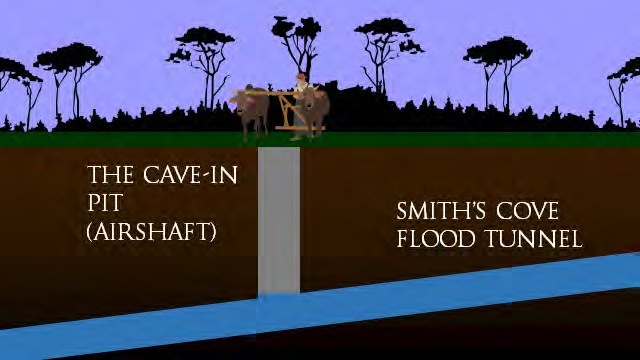 Many Oak Island researchers believe that the Cave-In Pit might be the remains of an airshaft dug by the original builders of the Smith’s Cove flood tunnel. 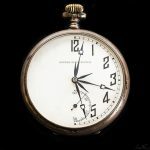 In 1893, treasure hunter Frederick Blair and his Oak Island Treasure Company excavated the Pit and were flooded out by seawater when they reached a depth of 55 feet. 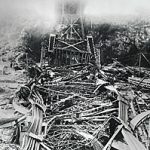 Later, when charges were detonated near Smith’s Cove over the suspected flood tunnel, the water in Cave-In Pit (as well as the Money Pit) frothed and bubbled. 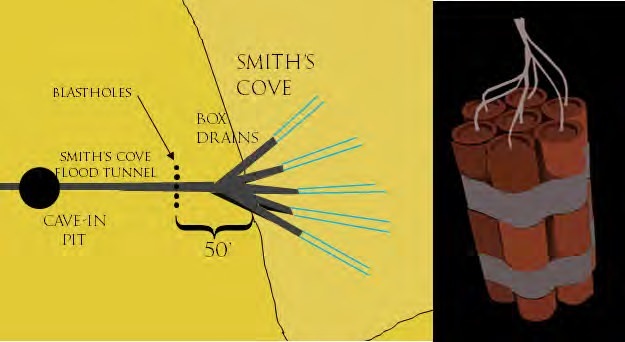 These findings suggesting that the Cave-In Pit is indeed connected with the Smith’s Cove flood tunnel. Scotsmen from New England- was that of the lost treasure of pirate captain William Kidd. little is known of Kidd’s early years, history shows that the Scotsman, at the age of 35, served aboard the Sainte Rose, a French privateering ship. At that time, King James II of England had friendly relations with the ‘Sun King’ Louis XIV of France, a fellow Catholic monarch. In 1688, however, King James was ousted from the British throne by the Dutch monarch William III, Prince of Orange, following William’s invasion of England with a fleet of 600 ships and 40,000 soldiers. The Protestant William III, upon taking the English throne, thrust England into the ongoing Nine Years’ War, a conflict between France and much of the rest of Europe. 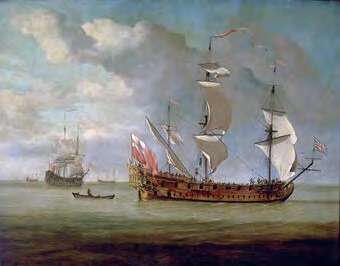 Thus, England went to war with France, and the French privateering ship Kidd served on was given a letter of marque to capture English vessels. Kidd and seven other British crewmembers were loath to attack fellow Englishman. Under the leadership of Kidd and a Cornish privateer named Robert Culliford, the Britons mutinied against the Sainte Rose’s French crew, succeeded in taking he ship, renamed the ship the Blessed William (after the Blessed William of Hirsau (an 11th Century Benedictine abbot)), and named William Kidd their new captain. 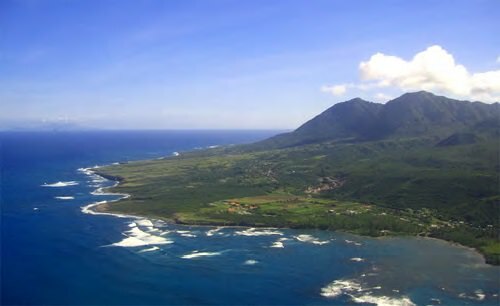 Kidd and his crew sailed the Blessed William into Nevis, a small English island colony in the Caribbean Sea, where the governor of the colony welcomed them into his own small fleet. Although the governor could not afford to pay Kidd and his crew, he allowed them to take whatever booty might be had from the French ships and settlements they would inevitably attack. 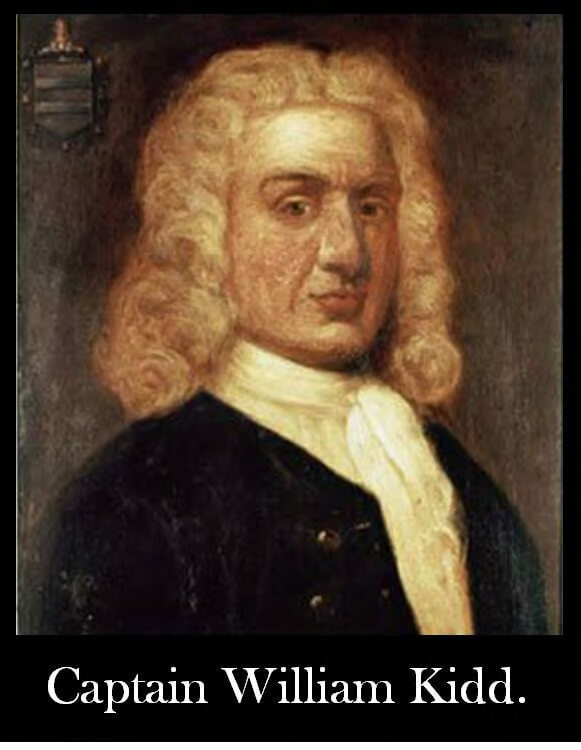 And thus William Kidd became a respectable English privateer. Throughout the Nine Years’ War, Captain Kidd and his crew defended the island of Nevis from French navy men and privateers. During this time, they attacked the small French Caribbean island of Marie-Galante, looting a modest sum in the process. They also captured a French privateer ship, which they adopted as their own. 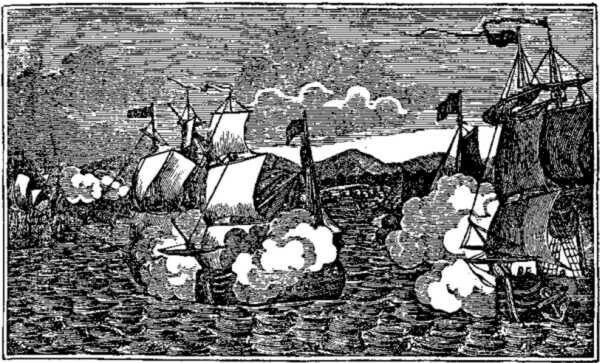 In February 1690, Robert Culliford, the Cornish privateer who had help Kidd commandeer the French-crewed Sainte Rose back in 1689, led a mutiny against Captain Kidd. While Kidd was ashore the island of Antigua, Culliford and the rest of the crew, tired of the strictures that accompanied licenced privateering, left the docks and sailed into the Caribbean to pursue the pirate life. Relieved of his command, Kidd boarded a ship to New York, where he promptly married Sarah Bradley Cox Oort, a wealthy young English widow, and became one of the richest men in town. 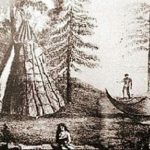 In the small colony of New York, Kidd became an active member of the community. In addition to opening up a tanning mill in what is now Manhattan’s Upper East Side, he used his newfound wealth to sponsor community projects, such as the construction of Trinity Church, located at the intersection of New York’s Wall Street and Broadway, today near the base of the Freedom Tower. Kidd lived with his wife, and later his daughter Sarah, in an opulent three story mansion built half a century earlier by a Dutch merchant of what was then New Amsterdam. Kidd quickly tired of city life and returned to the sea. For four years, he worked as a merchant captain, shipping goods to and from New England and the Caribbean. In time, he tired of that life, too, and decided to seek fame and fortune in London, England. 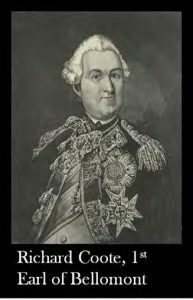 There, he was approached by New York merchant Robert Livingston and Governor of New York, Massachusetts, and New Hampshire Richard Coote, 1st Earl of Bellomont. The two men asked Kidd if he would consider accepting a commission to attack pirates and enemy French ships and appropriate whatever plunder he could from them. Kidd agreed to take on this privateering assignment, and his venture was subsequently (and privately) financed by four of the most powerful lords in England: The Earl of Orford, the Baron of Romney, the Duke of Shrewsbury, and Sir John Somers. These men stood to gain 75% of whatever booty Kidd managed to accumulate, notwithstanding the tax he owed the Crown. 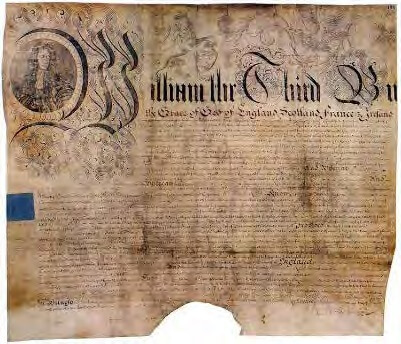 Finally, Kidd was given a letter of marque, signed by King William III, reserving 10% of any loot he acquired to the English Crown, which authorized him to attack and plunder both pirate ships and enemy French vessels. On his new 34-cannon ship, Adventure Galley, Captain Kidd sailed down the Thames River to the coast. On the way, he and his crew humorously disrespected the crew of a yacht of the Royal Navy. As punishment for the offense, the captain of the yacht pressed a large number of Kidd’s loyal, hand-picked crew into naval service, leaving Kidd with a barely functional skeleton crew. Short-handed, Kidd sailed across the Atlantic, legally capturing a French vessel in the process, to the port of New York. There, he supplemented his meagre crew with a large number of hardened pirates. In order to convince these rough sailors that service aboard his ship would be a worthwhile endeavour, Kidd violated is letter of marque. Specifically, he agreed to give the crew 75% of whatever plunder they might acquire, as opposed to the 25% stipulated by his licence. This misdemeanour would contribute to his eventual undoing. His ranks filled, Captain Kidd set of for the Indian Ocean off the Mughal Coast where pirates, sometimes referred to as Roundsmen, frequently plundered Mughal ships filled with exotic goods and Mecca-bound Muslim pilgrims, along with the merchant vessels charted by the British East India Company that often accompanied them. He set out determined to abide by his letter of marque and capture as many pirate ships and French vessels as he could. notorious pirate haven, Kidd and his crew sailed north to the Horn of Africa at the entrance to the Red Sea. Again, there were no pirate ships in sight. By this time, Captain Kidd’s crew was growing restless, and whispers of mutiny rippled throughout the decks. In the summer of 1697, Kidd’s ship fell in with a south-bound British Royal Navy squadron commanded by Commodore Thomas Warren. Fearing that Warren, whose vessels were severely undermanned, would press a large number of his crew into naval service, Kidd quietly evaded the squadron at night. This evasion led Warren to believe that Kidd and his crew had something to hide, namely that they had been engaging in piracy, and subsequently spread the rumour throughout the East India Company that privateer Captain Kidd had gone rogue. By the fall of 1697, Kidd’s crew was on the brink of mutiny. On October 30, 1697, one of Kidd’s crewmembers, gunner William Moore, sat on deck sharpening a chisel and muttering under his breath. When Kidd inquired as to Moore’s rumblings, the gunner urged Kidd to attack a nearby Dutch ship and thereby commit an act of piracy. When Kidd, ever loyal to the Crown, refused, a quarrel ensued which ended with Kidd cracking Moore over the head with an iron-ringed bucket. The blow fractured Moore’s skull, and the gunner succumbed to his wound the following day. Not long after Moore’s death, Kidd and his crew, through the devious practice of flying false colours, managed to capture a French ship without a shot being fired. This capture was in accordance with Kidd’s legal commission. On January 30, 1698, Kidd, using similar tactics, captured the massive Quedagh Merchant, an Indian merchant vessel loaded silk, tea, spices, satin, muslin, gold, silver, and other valuable East Indian goods. 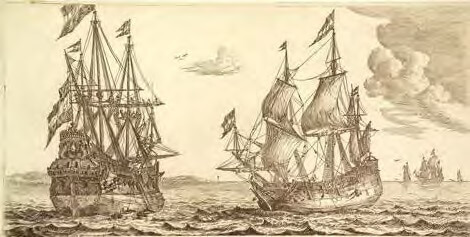 Kidd learned that the ship was chartered by the French East India Company and owned by a company of Armenian merchants, and was initially satisfied that this capture was a legitimate one. However, upon further investigation, he learned, to his dismay, that the ship’s captain was English, and that it was part of the same Muslim fleet which’s piratical predators he was tasked with combatting. Worse, a large proportion of the ship’s cargo was owned by a senior official of Mughal India, a nation allied with England. Kidd tried to convince his crew to return the ship’s cargo, but the disgruntled sailors would have none of it. Unwilling to risk a mutiny, Kidd reluctantly acceded to their demands and set sail for Boston. His capture of the Quedagh Merchant branded him as a pirate, and his notorious reputation quickly preceded him throughout the Atlantic. With the wealth of the Quedagh Merchant in their hold, Captain Kidd and his crew sailed to Madagascar, where he met with the crew of Captain Robert Culliford, the Cornish privateer-turned-pirate who had led the mutiny against him back in February 1690. Instead of attacking Culliford and his crew as he ought to have done, Kidd instead boarded Culliford’s ship and drank to the pirate’s health (although it should be mentioned that some historians believe Kidd was bent on attacking the notorious pirate, but refused to do so out of fear that he was outmanned). This act further cemented his reputation as a pirate. Following this incident, a large number of Kidd’s crew defected to Culliford’s, leaving Kidd with a 13-man skeleton crew. Captain Kidd and his tiny crew, having abandoned the rotting Adventure Galley for the Quedagh Merchant, set sail for New York. On the island of Hispaniola, Kidd abandoned the Quedagh Merchant, the ship he unlawfully captured from the Muslim fleet, for a new ship called the San Antonio before sailing northwest to New York. Just outside the New York harbour, Kidd received word that his backer Richard Coote, 1st Earl of Bellomont, was in Boston, and that he agreed to offer Kidd clemency for his piracy. 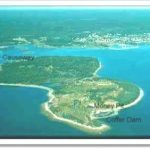 Kidd agreed, first caching a large part of his treasure on Gardiners Island before continuing to Boston by a circuitous route. There, Coote betrayed him by having him arrested on July 6, 1699. 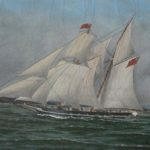 Over the following year, Kidd endured a long imprisonment followed by a short, hugely unfair trial in which he was ultimately convicted of piracy and the murder of his gunner William Moore. Throughout this trial, he pleaded his innocence, pointing out that the Quedagh Merchant he captured had a French pass, and that his letter of marque licenced him to capture French vessels. 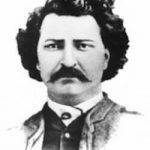 After a verdict of guilty was passed, Kidd told his captors that he had buried a large portion of his treasure, and that he would help them find it if they spared his life. His entreaties fell on deaf ears. On May 23, 1701, at London’s Execution Dock, Captain William Kidd was hanged. 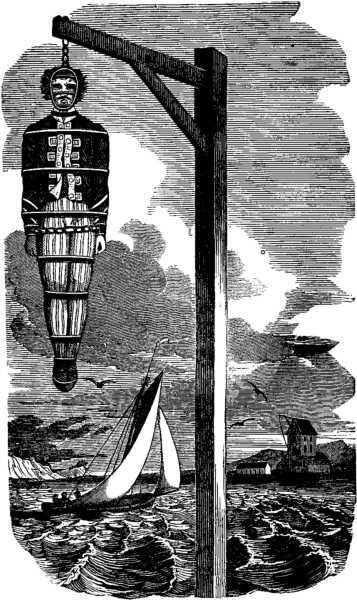 His body was suspended in a gibbet over the Thames River for three years as a warning to pirates. Legend has it that half a century later, in the mid-1700’s, and old sailor from New England lay dying. On his deathbed, he confessed to his family that he had been a member of Captain Kidd’s crew. Before passing away, he disclosed that he had helped the pirate captain bury a sizeable treasure on an island east of Boston. 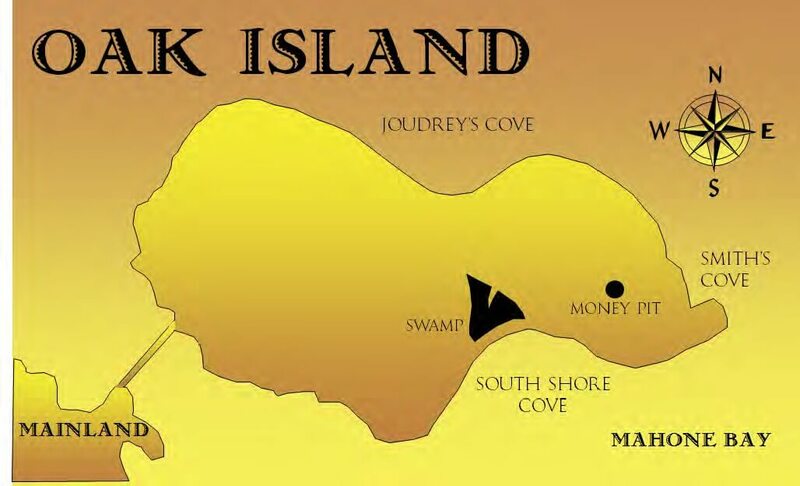 Some Oak Island researchers speculate that this island was none other than Oak Island. 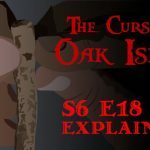 In this episode of The Curse of Oak Island, metal detection expert Gary Drayton discovered a large iron nail in the north end of the Oak Island swamp. Although the object at first appeared to be a railroad spike, Drayton claimed that the item was in fact a nail used in the construction of old ship decks, and that he had discovered many similar artifacts which were used to build the decks of Spanish galleons. 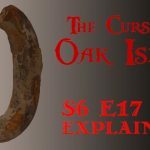 This find, coupled with diver Tony Sampson’s discovery of the plank in the Oak Island swamp, lends credence to the theory, held by a number of Oak Island researchers, that an old ship of some sort lies at the bottom of the Oak Island swamp. Drayton’s comment about the possibility of the nail’s being from a Spanish galleon is particularly intriguing considering the theory held by veteran Oak Island treasure hunter Dan Blankenship and acclaimed Oak Island authority D’Arcy O’Connor that Oak Island’s underground workings are attributable to the crew of a wrecked Spanish treasure galleon which beached on Oak Island while en route from Havana to Spain sometime in the 17th or early 18th Centuries. I agree with Larry. How gullible do you think we are? I guess some people just take everything that is forced down their throats like baby birds! 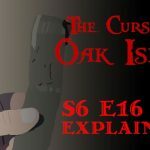 There may be treasure buried on Oak Island but the stupid “evidence” like that one railroad spike is not convincing enough for me to keep warching. I don’t care what your so-called “expert” says, that is nothing more than a railroad spike, the same as I have a bucketful of rusty ones which are identical which I dug up myself off our out of commission railroad bed in the midwest! Please tell me you will pay me a hefty price for them and you can throw them into the swamp for more “evidence”!!! 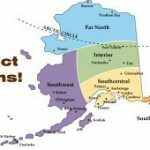 Excellent update on the ‘Search’! Always an enjoyable read! A”ship” with only one “deck spike” to be found, instead of a number of them being found in some outline resembling the supposed “deck”? Also no other examples of the many pieces of iron hardware to be found in any ship of that vintage? And then we are shown what is plainly, to anyone who has seen/held one, a railroad spike, …and asked to believe it is a special ship-deck spike like “many” others seen by one of the characters, at sunken shipwreck sites. 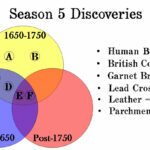 I am only surprised that the producers had the guts to try to palm this “discovery” off on what they must hope are unbelievably gullible viewers!